The construction industry accounts for only 4 percent of New York’s jobs but a full fifth of the state’s occupational deaths. New York’s skyline keeps soaring upward, but every once in a while, gravity catches up. The latest lethal crane collapse in downtown Manhattan was another sad marker of how the real-estate industry’s breakneck ascent can reach devastating extremes. 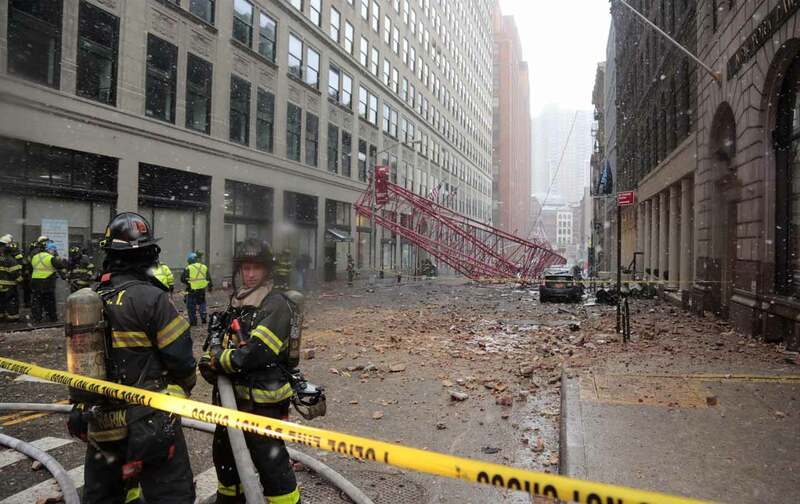 Following the collapse, which left one dead and three injured, Mayor Bill de Blasio’s office announced that the tragedy was under investigation, but noted that the company had evidently followed procedures for properly securing the crane, and that it had been several years since such a deadly crane incident. Shortly afterward City Comptroller Scott Stringer cited the crane incident as another indicator of the city’s lax attitude on construction safety. Noting various reports of construction accidents in recent years, Stringer accused the Department of Buildings (DOB) of lagging on implementing safety reforms first recommended under the last mayoral administration. According to Stringer, a November 2014 audit showed the mayor’s office had yet to implement many of the 65 recommended reforms that came out of a safety review initiated in 2008 under Mayor Michael Bloomberg. The mayor’s office countered that currently about 30 of 65 recommendations had been implemented and another 23 were pending. But the optics of the collapsed crane have spurred action, at least for the moment. The mayor announced several new construction-safety measures, including requiring more precautionary measures for workdays with heavy winds, deploying safety personnel to crane sites, and hiking fines for failing to secure cranes appropriately, from $4,800 to $10,000. According to Construction Dive, the city will also initiate a “safety sweep” of construction sites, as part of a larger oversight plan for high-risk worksites. In the past, the comptroller has cited a potential inherent conflict of interest in the DOB’s mission, as its mandate involves both facilitating development projects, on the one hand, and overseeing worksite safety, on the other. For everyday New Yorkers, the occasional freak crane collapse highlights a general sense of vulnerability shared by residents and workers alike: The real threat that looms is not just towering machinery but an industry rife with perverse incentives. But any new regulations on crane safety may face even bigger and bolder resistance from real-estate elites. Days after de Blasio announced a temporary freeze on crane use at construction sites, builders assailed the move as government overreach, warning that curbing construction work could potentially throw many pending projects off course. Your chances of getting killed by a random falling crane are slim, but every day construction workers teeter on the edge of an economic precipice, earning poverty wages and routinely being cheated out of pay. NYCOSH’s analysis of 2015 construction data found that the construction industry overall accounted for a fifth of occupational deaths in New York, but only 4 percent of total employment. Across New York State, Latinos, and immigrants faced the greatest risks, as did non-union workers. Employers that exploit the poor to build housing for the poor may factor into the rollout of de Blasio’s newly announced affordable housing plan, which will strive to expand low- and moderate-income housing stock by mandating developers to offer “affordable” units (though the criteria for “affordability” is often criticized for unrealistically high rates compared to local income levels). Just as labor advocates link economic justice and worker safety, housing advocates draw a parallel between unequal development and developers that abuse workers.